Today AI offers unparalleled opportunities for any business owner. On one hand, leveraging AI into your enterprise isn’t difficult, because the adaption process is quite fast, and the usage of AI is extremely convenient. But, on the other hand, custom development may be expensive. Before making a decision, entrepreneurs need to conduct a complex feasibility analysis to evaluate what value the enterprise will gain from the use of AI. From our previous post, you could learn some of the ways to adopt Artificial Intelligence for your business. Automated accounting and customized marketing information, efficient inventory and supply chain management, as well as improved maintenance schedules are just a few benefits of artificial intelligence used in business. By and large, the game is worth the candles. Let us show you some examples. 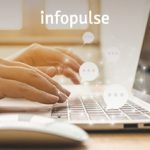 In the following blog post, Infopulse presents the most striking advantages of using AI in different business branches, namely, in the spheres of Finance, E-commerce, Manufacturing, Telecommunication, and Automotive. Each of these industries has its own ways to implement AI technologies – we’ll review them one by one. AI in financial institutions may be used in the form of personalized customer services or chatbots. Clients always look for convenience and fast response when dealing with their financial issues. AI-developed chatbots provide financial guidance 24/7 through voice records and text messages, and may quickly resolve any type of exigencies. Moreover, these bots may not only perform day-to-day transactions but also track and analyze customer’s preferences to improve the enterprise efficiency and preserve the client’s loyalty. AI is also involved in robotic process automation (RPA), which may be used as a major tool for analyzing and processing data of any financial establishment. With its help, banks may review and extract the needed information from thousands of documents within a few minutes. AI can dramatically reduce the time spent on data processing and save countless hours of work, allowing to focus on more important tasks. These are just a few advantages of artificial intelligence in finance; other benefits of AI include risk assessment, fraud detection, and many others. AI is a real game changer for retail entrepreneurs. It wields a major positive influence on the company’s productivity, task automation, and revenue. With artificial intelligence, retailers may implement efficient customer support, advanced product search, and storage methods, as well as create robotized stores that will save massive amounts of operational costs. Retail business owners constantly struggle with either excessive or short supply of products. AI offers an efficient solution which helps to identify the demand for a particular product on the basis of different factors. A great example of a successful AI use case would be Morrison stock forecasting that helped to reduce the company’s shelf gaps by 30%. Furthermore, retailers may implement AI alongside with computer vision and augmented reality to create fitting rooms with virtual avatars of the customers. Such technological advancement makes the purchases more nimble and easy, thus resulting in dramatic increases in sales. Machine learning software is now successfully paving its way into the manufacturing business sector. In fact, there’s a specific term used to describe global trends of implementing AI in manufacturing – Industry 4.0. Complex AI algorithms are used for predictive maintenance that allows excluding possible machinery failures. In addition, similar algorithms may be used to enhance product quality by tracing minor technical abnormalities and deviations from the quality standards. Today, there is a growing tendency to use artificial intelligence in manufacturing for developing generative design software. 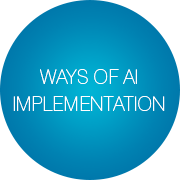 AI analyses a wide range of factors, from the initial product parameters to budget limitations, and then delivers an optimal design solution. One of the principal artificial intelligence applications in the telecommunications industry is customer support provided by chatbots. AI-powered customer services may evaluate the requests and network data to find the required solutions faster. Artificial intelligence is also capable to analyze thousands of emails in no time, detect the “hot leads” and send them directly to the sales department. Proceeding from the customer’s behavioral patterns and viewing preferences AI can create personalized recommendations for every customer; make relevant offers based on the latter data, and analyze social media to understand what attracts the customers and what drives them away. AI can be set for predictive maintenance, which monitors the networking signals and instantly detects any issues in real-time. Thus, if a telecommunication business aims to provide the ultimate customer experience, AI is the top choice. Influence of artificial intelligence on the automotive industry is fundamental. It powers advanced safety features like risk assessment and driver monitoring that uses cutting-edge cameras and sensors to analyze the current physical stance of the driver. AI may also identify the driver and passengers to automatically adjust the car compartments to the set preferences, and exclude car theft probability. Most importantly, AI can be a “driving” power for smart cars, which utilize IoT and cloud technologies. In principle, such cars process massive amounts of data to provide maximum convenience to the driver. A smart car can suggest driver a nearby restaurant based on driver’s eating habits, which are processed from social network data. Such smart AI-based cars can soon become an integral part of the automotive industry. Apart from the above-mentioned industries, there are also other sectors where AI may be implemented, like government, agriculture, advertising, and many others. Governmental workers can use AI to exclude tax evasion and make financial coordination more effective, as well as to improve auditing and enhance cybersecurity. As for agriculture, AI may track and predict weather changes, monitor crop and soil, and harvest crops at a faster phase than human workers. For entrepreneurs who work in the advertising sphere, AI may improve your marketing by personalizing messages for customers and enhance the company’s production process. For the moment, the rates of leveraging AI into business are soaring and the future of artificial intelligence looks very promising. AI is destined to become an integral part of most business branches. No wonder, because the future of business growth and prosperity lies within the application of artificial intelligence. AI already offers unparalleled opportunities for business owners, and the best is yet to come. AI will help businesses make the most out of their enterprise and advance their business growth. With the course of time, increasingly sophisticated and effective AI solutions will emerge and continue to evolve at an even faster pace. Only a few understand that the future is now, and the time is ripe to begin using AI for your business. 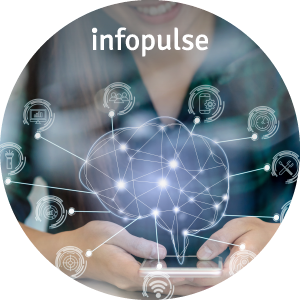 The Infopulse team has extensive expertise working with the widest range of AI and Data Science projects, including human resources AI solutions, chatbots, and virtual assistants, as well as sales forecasting AI and others. We would be happy to provide you with further guidance in regards to the development and adoption of artificial intelligence that will meet your business goals. Kindly contact us to get free initial consulting on your AI project.